Will my egg sink or float? Free download. Great for PK-3rd grade. Give your students a variety of materials to choose from and a plastic egg. They can fill the egg and test it in a bucket of water. 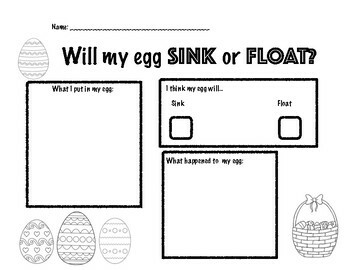 Discuss if the egg floats or sinks. For PK/Kindergarten, I suggest putting a piece of tape on the holes of the egg, but for the older students, leave tape out as an option... allow for exploration and trials!